I have nothing against mirrors. They are very useful. Mirrors can be used to help you put on make-up, shave, floss your teeth, etc. Dentists use tiny mirrors to see all of our teeth. You can install large convex safety mirrors to see around blind corners and prevent accidents. 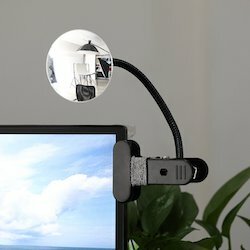 The Clip-On Cubicle Mirror/Computer Rearview Mirror was invented to help workers in open office spaces. Many open office plans have desks facing walls or have desk ‘nodes’ where workers face each other and have their backs open to the rest of the room. However, millions of years of evolution has taught humans that sitting with our backs exposed makes us vulnerable and we instinctively seek to minimize that threat. When we are in this unprotected situation, our stress levels increase. The theory is the Clip-On Cubicle Mirror/Computer Rearview Mirror is supposed to help us minimize this stress by allowing workers to see people walk up behind them. In my opinion, this mirror will do the exact opposite. Any flicker in the mirror, would be a distraction. The worker would continually look to see if the flicker is a potential threat. Rather than improve productivity, this device may actually decrease productivity and increase employee stress levels. Let’s solve the whole problem by redesigning office spaces so that these mirrors are not needed and workers, (especially women) feel safe, comfortable, and less stressed. Good lighting in our homes is essential. We need light to read books, work on projects, and perform basic household tasks. The brightness and hue of the lighting we choose can change the look and feel of our home. When I was growing up, most homes had incandescent light bulbs sometimes kitchens and workshops had fluorescent ones. Our choice of light bulbs was fairly limited. Today, however, there are many options including LEDs, compact fluorescent (CFL), halogen, and ‘smart’ bulbs that can change colors and turn on and off with voice commands. Lowes Hardware has a great explanation of wattage, light output (lumens), and temperature (Kelvin) of light bulbs and a guide for choosing the correct lighting in your home. We encourage you to read their articles if you are unsure of what type of lighting and lightbulbs you need. Personally, I prefer LED bulbs. They are energy efficient and are cool to touch. They do not contain mercury like fluorescent/CFL bulbs so they are easier to dispose of. With LED smart bulbs, you can dim or change the colour/hue. This is helpful because with the smart bulbs, one lamp can serve many purposes. You can increase the brightness and change the colour to cool white to easily see your sewing project then turn the brightness down and the colour to warm enjoy a relaxed ambience. LED bulbs are expensive (especially the smart bulbs) compared to many other options however, if you gradually replace your regular bulbs with LED bulbs over time, the financial impact will be reduced. Because LED bulbs last for many years, you won’t need to replace them very often! Go around the house and collect all of the light bulbs you may have stashed in various closets and cupboards. Dispose of any lightbulbs that are broken, damaged, or no longer work. You may need to test some of them in a lamp. Remember that fluorescent and CFL bulbs contain mercury so you cannot throw them in the trash. The Environmental Protection Agency has advice on how to dispose of them responsibly and where to find local disposal facilities. Separate the remaining light bulbs into categories. For bulbs of all the same size and shape, you could separate them by brightness and hue (wattage, lumens, temperature). You may have specific bulbs for specific fixtures so they could be in a separate category. 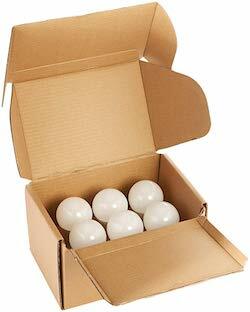 Light bulbs can be easily stored in the package they come in. If they ship from the warehouse to the consumer without breaking, that package is sturdy enough. Be sure to label the box with the type of light bulb and where it is used, for example, LED 60W soft white for ceiling fixtures in living room, hallways, bedrooms. If you have uniquely shaped bulbs, such as those for outdoor floodlights or chandeliers, you could wrap them in packing paper and write on the paper the type of bulb and what it is for. You can create your own lightbulb storage by gluing plastic or foam cups to cardboard sheets and stacking them in a bin. Professional organizer Linda Chu from Vancouver demonstrated this technique for storing Christmas ornaments but it would work equally well for lightbulbs. 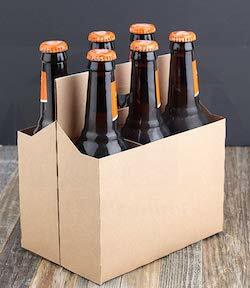 Re-purposing a cardboard bottle tote is an option too. We store light bulbs in a small Rubbermaid tote, either in the original packaging so it is easy to see what the bulb is, or we wrap the bulbs in fruit net wrap that the local grocery store was going to throw in the garbage anyway. Designate one spot in your home for light bulb storage. It could be in a basement or linen closet. When you remove the last bulb of a specific type from your storage box, remember to add that type of light bulb to your shopping list. If you have any light bulb organizing tips to share with our readers, please feel free to leave a comment below. 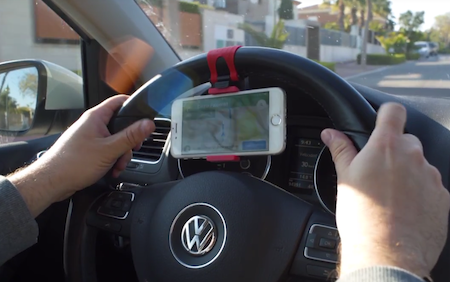 The Catch & Go steering wheel smartphone holder holds smartphones from 3.5″ to 5.5″ wide. It quickly and easily attaches to your steering wheel. You can use your GPS and talk on your phone hands free. See the video here. It is important to have a hands-free device when you are driving your car. Keeping both hands on the steering wheel is the most effective way to control a car. It is also important to keep both eyes looking out the windscreen at the road, traffic, and surroundings. I briefly considered calling the device a multi-tasker because it would allow you to watch a movie on your phone while crashing your car at the same time. The other issue I have with Catch & Go’s steering wheel smartphone holder is charging the smartphone while it is attached. Often GPS apps can drain the phone battery significantly so the ability to charge the phone while using it would be helpful. You would have to have a longer cable to compensate for turning the steering wheel but would the cable get tangled if there was too much slack? If the steering wheel turned and the cable was too tight would it yank the phone out of the holder and cause further distraction? The steering wheel smartphone holder just does not seem like a safe option to me. In all fairness, Catch & Go makes a couple of different phone holders that do not attach to the steering wheel. They would be a lot safer as the phone would not be in your direct line of vision nor cause the cord to get tangled in your legs while driving. Despite all this, I really like the design — but not for driving. It would be handy to have one of these easy to install gadgets for the kitchen. Hanging the phone from a cupboard door handle would keep it off the messy counter. Would you use it for driving? If you didn’t use it for driving, where would you use it? After so many years of Unclutterer, you might think we would run out of unitaskers to make fun of but sadly that is not the case. Our Unitasker Wednesday series is still going strong. It takes up space in your home and your life but does not give much in return. It only does one thing, and usually that thing is really unnecessary or superfluous. In order to fulfill the definition of unitasker both of the above criteria must be met for the owner/user of the item. Let’s take the waffle maker as an example, Unclutterer Matt, insists that a waffle maker is a unitasker. It takes up a lot of cupboard space. It only makes waffles. 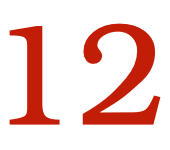 It is used only a few times a year. Unclutterer’s editor-at-large, Erin disagrees because she uses a waffle maker to make other foods and she enjoys using it. Erin gets lots in return for the item that takes up space in her cupboard! Erin also loves her ice-cream maker even though Matt believes that it too, is a unitasker. The Banana Saver was declared a unitasker, but I heartily disagree. I gladly sacrifice the space a in the cupboard for the Banana Saver because it allows me to avoid cleaning smashed banana in the children’s backpacks and lunchboxes. Unclutterer Jeri mentioned that some multi-purpose items may not be as effective as unitaskers. We have mentioned that when unitaskers keep you safe, save you time, effort, and money they can be valuable. Every week readers chime in and declare their love for the unitaskers we feature. Sometimes it is because their children will only eat tacos in the TriceraTaco taco holder, or the 60 second salad maker really does save them time, or the Flying Screaming Monkey brings them joy. Whatever the reason, if you use it and you love it then for you it is not a unitasker. We plan to continue with our poking fun at items in Unitasker Wednesday posts and we appreciate each and every comment even if they respectfully disagree with us. Diversity enhances innovation and creativity. It is our strength. Reader question: How do I recycle broken toys and books? I have lots of toys (mostly plastic) that cannot be donated or passed down. They either broken or missing parts. How do I recycle them? Can I just put them in the recycling bin? What about children’s books that are either ripped, missing covers, or stained. Can I put them in the recycling bin as well? One more question: What is a good way to store books for a long time to be passed down? Many parents struggle with these questions Angie so thank you for asking! I’m not suggesting that you become an artist in your spare time but consider listing the pile of broken toys on Craigslist or Freecycle and see if a creative-type person or artistic group wants them. One of the more complicated parts about recycling is that every municipality has a different recycling program. The best thing to do is to visit your city’s website and find the information about recycling. Cities may have more recycling options if you are able to drop off at their depot. Earth911 does a great job of explaining the mystery of why toys are so difficult to recycle. Another option for recycling toys is to contact TerraCycle and purchase a Zero Waste Toy Box. TerraCycle will ship you an empty box, you fill it with broken toys then ship the box back using the pre-paid shipping label. TerraCycle will separate the toy’s components and ensure they get into the correct recycling stream. The Zero Waste Boxes are expensive ($95 USD for the small toys box) so you may want to collaborate with other parents in your neighbourhood, community centre, school, or house of worship. After all, saving the planet is a good cause. Most untreated paper can be recycled. Many books — especially children’s books cannot because they have been treated with wax, glues, or plastic coating. Investigate your municipality’s recycling website to see what the options are for recycling books. Earth911 explains the mysteries of book recycling and has some great suggestions for used books including books in “less than prime” condition. TerraCycle also has a Zero Waste Book Box which might be an option for your school or local library. Reading with children is a great way to form a lasting bond. I kept many of our children’s favourite books including the entire Franklin the Turtle series. To tell the truth, I think I kept them more for me than for my kids. Should I be blessed with grandchildren someday, I would love to share these books with them. In addition to our best tips on how to store treasured books, I would suggest to do a gentle cleaning of children’s books. Use an old, clean and soft toothbrush to remove any caked-on food or playdough. If the books have been on a shelf for a while, vacuum the edges with a soft brush using the lowest suction setting. Blot any greasy spots with an absorbent cloth. Ensure books are dry before storing. Thanks for your great question Angie. We hope that this post gives you the information you’re looking for. Today we’d like to introduce another eggsquisite unitasker, the plastic egg mold. 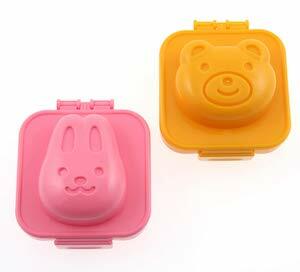 Made of rubber, these molds squish hard-boiled eggs into rabbit or bear faces. To use these molds, simply boil the eggs. Peel the shell off the eggs when they are very hot. Drop the hot eggs into the mold and close the lid. Submerse the closed mold in cold water for 10 minutes and your eggs will be shaped. Personally, I am not interested in peeling hot, hard-boiled eggs. The eggs turn out better when they are cooled then peeled anyway. I am also not interested in yet another “hand-wash only” item. I prefer everything to be dishwasher-safe. I suppose an item like this would amuse children and maybe get them to eat more eggs — maybe. Or we could just save money, space in our cupboards, and stop unitasker from ending up in the landfill if we taught kids to eat non-decorative foods. I have a one-bedroom apartment that is very full. I’m trying to figure out how I can keep visual reference materials, and how to manage and organize multiple paintings/projects at once. I manage to accumulate many, many, magazine photos and clippings. If I had a bigger space, I could just put them in a filing cabinet. But I don’t think I have enough room for one. And large canvases, etc. can’t go in a filing cabinet. Do you have any ideas or suggestions? The best thing to do reduce the physical space of your magazine clippings is to digitize them. Read our article on scanning magazine clippings for some tips on how to do this. Going forward, just take photos of your paper-based inspirations. A friend of mine takes photos of crafting patterns. She takes a photo of the item then photos of the instructions. To indicate the end of the project, she takes a photo of complete blackness (i.e. she puts her phone flat on the table and takes a photo of the table). This makes it easier to group the photo with the correct instructions on your computer or cloud drive. Remember that many magazines have digital versions that allow you to save the photos and articles automatically to sites such as Evernote and Pinterest so consider those options as well. Because you live in a small apartment, take advantage of vertical space. Use the full height of the wall as much as possible. For painting, consider a wall easel. They can be expensive but require no floor space. This model allows you to pull out the easel base up to a 70° angle to paint, and it has space to attach an easel lamp. You may wish to install STAS picture rails and sets to many of your walls. They can hold paintings you have finished, those you have partly finished, as well as blank canvases. 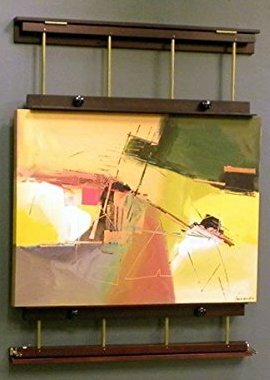 Because the hooks and holders on the STAS picture rails are easily adjustable, they can accommodate canvases of various sizes allowing you to maximize wall space. Another option is a photo ledge wall shelf. They may be much sturdier for your canvases but, because they are fixed on the wall, they cannot be adjusted easily. For reference, the Command photo ledge wall shelf holds up to five pounds, requires no tools to install, and does no damage to walls. In some cases, canvases must lay flat to dry. A folding laundry drying rack will allow you to lay your canvases flat and when they are finished, you can fold up the rack so it won’t take up any space. The drying rack is useful because it can also be used to dry clothes. Although you should cover it with an old sheet before you put paintings on it to keep it clean for your clothes. A bakeware storage rack is another option for storing canvases. This model is expandable so it can hold several canvases between each set of rods. The rods are only six inches high so that might not be adequate for extra-large canvases. This rack, although not adjustable, has taller dividers and quite large spacing that may be suitable for bigger canvases. Reader Question: I accidentally tossed my partner’s sentimental item. Help! I just read your post on Uncluttering and other people’s things as I was frantically googling how to ask for forgiveness when I’ve done just that. I just cleaned and uncluttered the house I share with my boyfriend. He was aware that I was doing a big overhaul, but I just realized that I tossed a red sheet that apparently belonged to his grandfather. I thought it was just an old sheet without the rest of the set. I am now dreading when he comes home and I have to tell him that I can’t find it. I will check the trash and stop at the charity shop tomorrow. I am now very worried that this may create a rift in our relationship when it was truly an accident — one that I now know not to repeat! I was careless in my mission to clean house and clearly not thinking that I shouldn’t toss out any items without seeking permission. I am anxiety ridden! How do I ask for forgiveness in this instance? Thanks for writing Rebecca. I can imagine how you feel right now. Believe me, I have been in your place before. A few years after my husband and I were married (almost 30 years ago now) I tossed out a few sentimental items of his. Like you, I had no idea the items were important. To me, they looked like clutter. Also, like you, my goal was to create a happy, relaxed, minimalist home. Other people have made similar mistakes. See our posts about Accidents in Uncluttering and Regrets and Legacy Items. This recent news article about $50,000 in jewels being accidentally donated is eye-opening as well. In my situation, I was very honest about what I had done and expressed my deepest regrets. If I had known, I never would have tossed the beloved items. I also explained what I had learned from the whole episode — never to toss anything unless given express permission. And in future, I would ensure that my partner had a chance to view items I accumulated before they went to trash/charity. Additionally, we created Legacy Boxes. Any items that we really wanted to keep, we put into our Legacy Boxes. All the best of luck to you in this sticky situation. Remember, honesty is the best policy. Editor’s note: Just before publication we heard back from Rebecca. Thank you so much for the thoughtful and helpful reply! Luckily, I recovered the sheet, still a hard lesson was learned. Have any of our readers encountered this problem? How did you handle it? 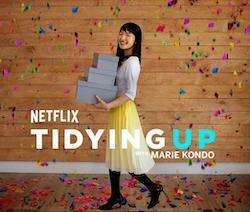 Over the last few days, I watched the entire season of Tidying Up with Marie Kondo on Netflix. After years of watching home organizing shows (in three different countries in two different languages), Tidying Up ranks very high on my preference list. There are a few issues I have with the KonMari method though. Here is my perspective about the show. Kondo respects the families and their home. At the beginning of each episode, she “greets the house” by kneeling on the floor for a few minutes. Personally, I find it a bit daft but this gives her clients time to focus on their vision of what they want their new organized life to be. This centres them and prepares them for the upcoming tasks. During the show, the clients do everything themselves. There does not appear to be a team or crew of organizers to help. The families sort through their own stuff. They decide what to keep (things that “spark joy”) what and what goes (things that don’t “spark joy”). We see them taking their own stuff to donation centres too. One of my favourite things about Tidying Up is that there is no “stuff shaming.” Kondo does not make the family members cry because they have too much stuff or they are not treating their stuff well-enough. She just keeps smiling and reminds them of their end goal. When the clients are unsure about keeping an item, Kondo does not judge. She tells them to keep it because they can always look at it later and change their mind. All of the professional organizers I know work this way with their clients. Tidying Up also has realistic timelines. In one episode, the final reveal was on Day 42 — six weeks after Kondo’s first visit. This allows families to carefully evaluate their decisions about which items truly “spark joy.” This is much more representative of the work that professional organizers do. I admit that I was pleasantly surprised when, in one episode, Kondo brought in an empty shoebox — a plain old shoebox — and told children to use it to organize their clothes. Because, she said, that when they were ready to buy a dresser, they would know how much space they needed. No shopping for containers and bins. No expensive furniture brought in by the show’s sponsors. Just respect for the clients, their needs, and their budget. The big reveal at the end of each show is the closest to reality TV that I’ve seen. There were mismatched hangers in closets. Shoeboxes on shelves holding (nicely) folded clothes. No renovations, no painting, no staging — just families proud of the work they accomplished. Kondo’s method for folding clothes is amazing. I’ve used her method with my own clothes. Everything looks beautiful. The clothes take up much less space. I think it is a bit corny to “communicate my affection” to my clothes by running my hands over each item. However, it removes all the wrinkles and helps me notice if there are stains or damage to the clothing. In other words, Kondo thinks people should keep books that they have enjoyed and still want to enjoy, and they should keep books that they have found useful and will likely still find useful in the future. Pending — Documents to act on such as bills and correspondence. Important — Documents to keep permanently such as contracts and insurance forms. Miscellaneous — Documents that you refer to often such as recipes from a magazine. In the short-term this is a quick way to separate what you need to deal with now, and what can be stored for later. In the long-term, this is a formula for cluttered, over-stuffed filing cabinets. There are many important documents that you need to keep for an extended period of time but do not need to keep permanently. People need to develop a routine for dealing with their papers on a regular basis. See the Unclutterer series on Records and Information Management to get not only your paperwork, but your electronic documents sorted, uncluttered, and organized once and for all. Tidying Up with Marie Kondo does not reveal any new or unique organizing techniques. However, it is an enjoyable show to watch. Kondo’s cheerful attitude and positive energy spreads to the families she helps. We would love our readers to share their thoughts about the show. Chime in with a comment and let us know what you think. Follow these seven steps for cleaner, good-as-new brushes and blenders. Wet the bristles with lukewarm water. Place a drop of makeup brush cleanser or [mild] soap into the palm of your hand. Gently massage the tips of the bristles in your palm. Squeeze out the excess moisture with a clean towel. Let the brush dry with its bristles hanging off the edge of a counter, thereby allowing it to dry in the correct shape. Never let your brushes dry on a towel — the bristles can become mildewed. The experts at Allure also states that brushes should not be dried vertically. Because the bristles are glued to the handle, soap/detergent and water can cause the glue to breakdown and the bristles will start to fall off. 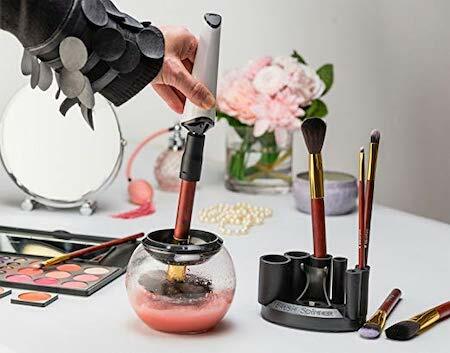 With brush cleaning so simple, I can’t imagine why anyone would need the Luxe Makeup Brush Cleaner with USB Charging Station. It is just a pile of clutter — the device, its charging base and cable, eight rubber collars to fit various brush sizes, and a special bowl to wash your brushes. It is a whole lot of non-recyclable material. If you really want to spin your brushes to clean them, get a glass (that you already have), fill it with cleaning solution, and spin the brush handle between the palms of your hands while the bristles are submerged in the water. No extra plastic. No batteries to charge. No clutter at all. We have a 3-month-old child who is just delightful. He has everything he could need or want at this young age! We had a conversation with both sets of his grandparents prior to Christmas explaining that he has everything he could want, but if they felt the need to buy for him then a book or two or some clothes would be sufficient. However, both sets of grandparents bought a heap of toys and clothes and books! It was very generous of them, but this is not something I want to see become a habit. We have trouble with storage as it is, so I would really only prefer one or two items to be given at holidays and birthdays. How do I have this conversation with our loved ones? Thanks for a great question Sarah. You mention that you already had a conversation with the grandparents and they didn’t seem to understand your request. You are not alone in your dilemma. At this time of year, Unclutterer receives several inquiries about dealing with generous extended family members. The short answer, is that I do not know how you should have this conversation with your loved ones. I do not know them or your relationship with them. I will provide several suggestions below perhaps one will work for you in this situation. If you are having trouble knowing how and where to start a conversation you may wish to read Crucial Conversations. Unclutterer Alex reviewed the book and says it is a must read for anyone who is intimidated by discussing potentially sensitive topics. The book may also help you communicate your wishes without the conversation becoming emotionally charged. Read Editor-at-Large, Erin Doland’s post on receiving unwanted gifts. You may find that it is easier emotionally and on family relationships to re-gift and donate than it is to keep having the same conversation every year. Unclutterer Jeri has some great tips for dealing with unwanted gifts. Although the post deals mainly with gifts from friends, her advice applies to gifts from family members as well. As Erin mentioned in her post, grandparents want to give. Rather than saying “no gifts” consider providing alternatives. For example, babies and toddlers don’t need a lot of “things” but eventually, that child might need tuition for college. Asking the grandparents to contribute to a college fund might be an option for your family. (Investing $100/year for 17 years can result in $3000). Grandparents could write a special memory or life advice in a card each year and the cards could be presented on the child’s first day of college. We would love to hear our readers’ suggestions on how they deal with this issue. Please feel free to leave advice for Sarah in the comments below. Thanks for your contribution Sarah. We hope that this post gives you the information you’re looking for. On January 6, 2007, we published our first blog post with our manifesto of simple living. It’s hard to believe it was 12 years ago but here we are, still promoting smart consumerism and avoiding distractions that prevent us from enjoying a modern, luxurious life. We’ve published over 4600 posts and received almost 75,000 comments. Our first Unitasker Wednesday was published in May 2007 and since then we’ve featured almost 500 unitaskers. The Forum was opened in November 2009 to allow fellow unclutterers to connect with each other and share ideas and resources. There are over 2000 topics and over 63,000 replies on our Forum. 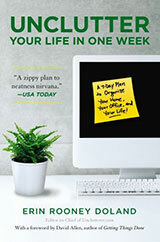 Unclutter Your Life in One Week was published in November 2009. 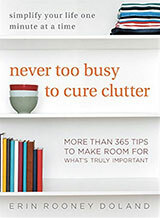 Never Too Busy to Cure Clutter was published in January 2016. We would like to thank all of the regular and guest writers that have contributed to Unclutterer over the years but most of all, we’d like to thank YOU, our readers, for your continued comments, ideas, and support, and encouragement.